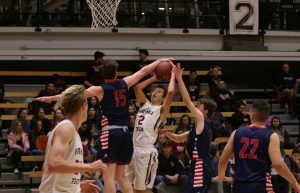 On Wednesday, March 7, the boys’ and girls’ varsity basketball teams participated in the opening round of the 2018 California Interscholastic Federation (CIF) State tournament. Both games were held at Ventura High School’s Tuttle Gym. 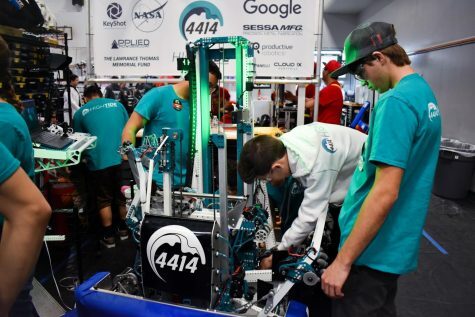 Following losses in the CIF Finals, both teams responded with blowout wins against their competition. 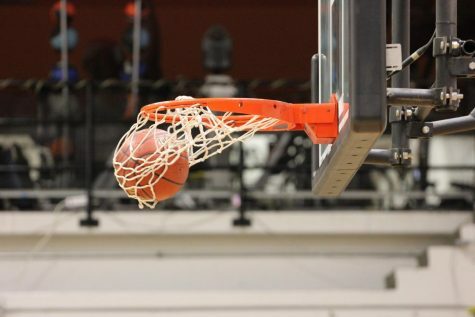 In doing so, the boys’ and girls’ teams punched their ticket to the second round of the tournament, which will be played on Saturday, March 10. 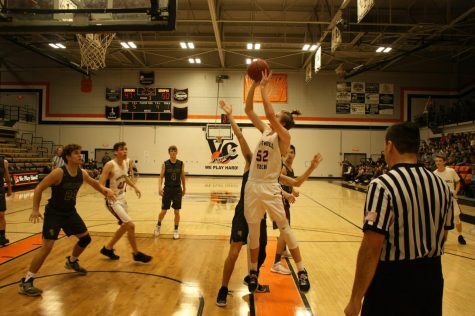 Although Wednesday’s forecast may have been ‘slightly cloudy’ or ‘sunny,’ it was raining three pointers for the boys’ basketball team against the Jaguars of Aspire Ollin University Preparatory Academy. More specifically, it was Nate Bova ‘19 who captivated the crowd with his impeccable range. Bova recorded a game-high 33 points while sinking eight from behind the arc. 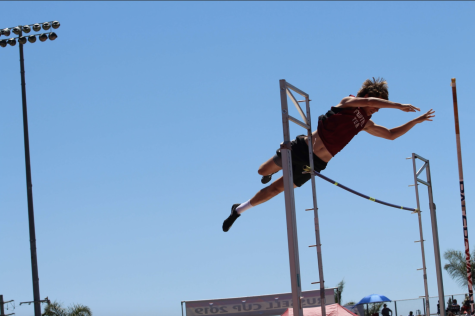 Even though the team had suffered a loss in the CIF Division 5AA Finals just a few days earlier, Foothill was still able to perform at a high level. Bova pointed out that the team was able to stay focused largely due to the encouragement of head coach Dean Prophet. Both teams held even at the beginning of the first quarter, as they were trading baskets nearly every possession. However, the Dragons sparked a 13-2 run near the end of the quarter, seizing the momentum and a 24-17 lead. Bova scored 15 of his 33 points in the opening quarter, which was more than half of the Dragons’ total and almost enough to match the Jaguars’ scoring in the quarter. The following quarter was back-and-forth in terms of scoring. Bova, Ty Macias ‘20, Bodhi McDonald ‘20 and Cisco Lomax ‘18 all added points to increase Foothill’s lead to 38-28. After halftime, the game started to slip away for the Jaguars. The Dragons opened the quarter on a 24-4 run; a deficit of which Aspire would not be able to overcome. 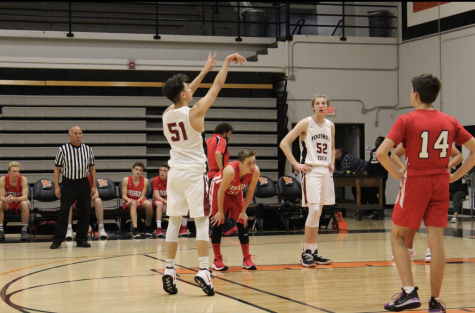 Foothill made six three-pointers in the third quarter, as Bova and Jack Vielbig ‘19 chipped in with a longball multiple times. The Dragons were able to maintain their 62-41 lead in the fourth quarter, and they held their ground on the offensive end as well. 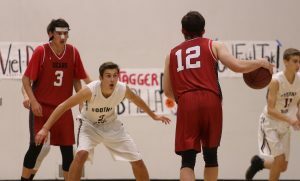 Although the Jaguars outscored Foothill 12-11 in the final quarter, that was all the Dragons needed. With a 73-53 first-round win, they had earned a bid in the next round. On Saturday, March 10, the Dragons will play host to the Cavers of San Diego High School. The second round of the 2018 CIF State tournament is scheduled to be held at Ventura High School’s Tuttle Gym. 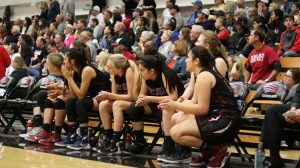 Just days following a heartbreaking loss in the CIF Division 4AA Finals, the girls’ varsity basketball team stepped up against the Bears of Selma High School. Abby Bova ‘19 explained that the team did not take the loss lightly. 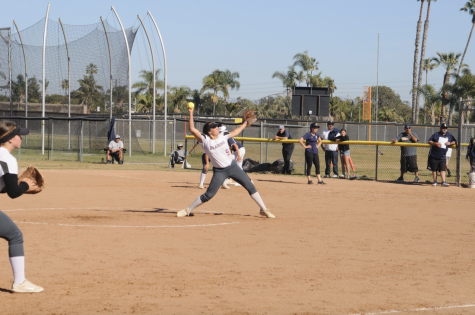 Instead, it served as a motivational tool for their first round matchup of the CIF State Tournament. Head coach Jason Edgmond’s starting lineup was unchanged from the CIF Finals game. 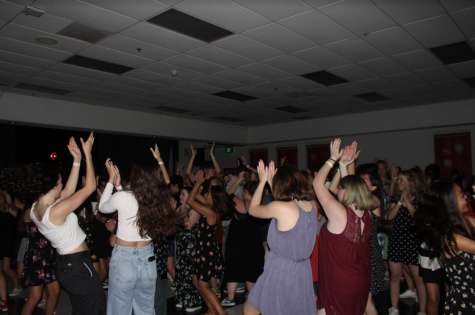 It consisted of Cydnie Gutierrez ‘19, Abby Bova, Emiline Bova ‘19, Abby Sourwine ‘19 and Maddie Ozbourn ‘19. After winning the tip-off, it was all Dragons for the entirety of the game. A quick five points for Emiline Bova, along with some baskets from Abby Bova and Sourwine, initiated a 12-0 Foothill run in the opening minutes. After one quarter, the Dragons led 22-6. Foothill’s offensive success was duplicated in the latter portion of the first half. The Dragons generated another 22 points while holding Selma to just 13 points. 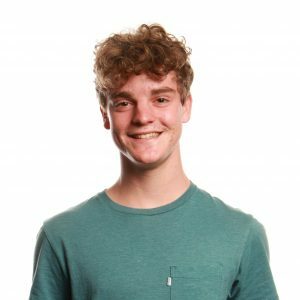 The second quarter came to a close immediately following a pass from Ozbourn to a wide-open Sourwine, who converted on a five-footer at the buzzer. The 44-19 lead kept growing and growing as the Dragons opened the second half with the same consistency that was displayed in the first half. Back-to-back threes from Gutierrez enlarged an already-massive lead and riled up an already-enthusiastic cheering section. In addition, the Dragons played lights-out defense in the third quarter. Struggling to create space to run their offense, the Bears managed only four points in the quarter while seeing the deficit increase to 67-23. In the fourth quarter, Edgmond sent his bench out to finish the remainder of what was a blowout victory. A conservative approach on offense only yielded three points for Foothill, but the game was already well in hand. 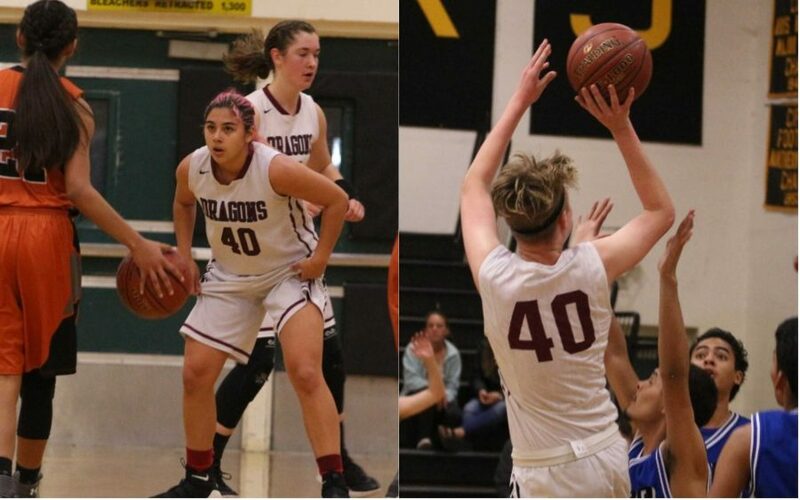 The scoreboard read 70-34 when the final buzzer sounded, signalling the Dragons’ advancement to the second round of the CIF State Tournament. Standout performances include Emiline Bova, posting 29 points along with seven rebounds. Gutierrez also had double figures in the scoring department, as she had 10 points. 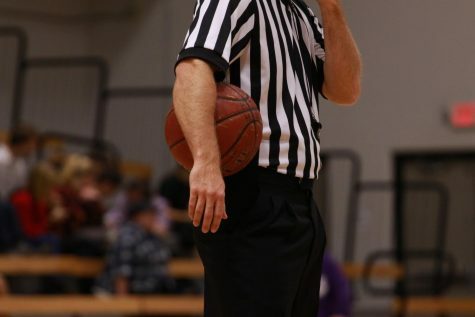 On Saturday, March 10, Foothill will have home-court advantage versus the Eagles of Immanuel High School. 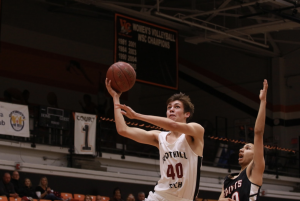 The second-round CIF State matchup is currently scheduled to be held at Ventura High School’s Tuttle Gym. “How have they got better than the Dragons?” The dogs have finished ahead of the Dragons for five of the past six years. For all the noise about how bad the Dogs were all season and how hot the Dragons were at the start of the season and how desperately unlucky at the end, the Dragons finished just two wins better than the Dogs. The Dogs has their worst season in recent memory and the Dragons their best and that amounted to two wins difference. The Dogs won two from two against the Dragons last year. They also won two from two in 2016 and two from three in 2015. In fact, the Dragons have only won one of their past 12 games against the Dogs. Why are you so convinced the Dragons are so much better than the Dogs based on half a season?